Irony. On the night before Hanukkah, tonight's Monday Night Football game was delayed because there was no light in Candlestick Park in San Francisco. As if it's not funny enough that a stadium named Candlestick had no electricity, it brings to mind the story of Hanukkah. 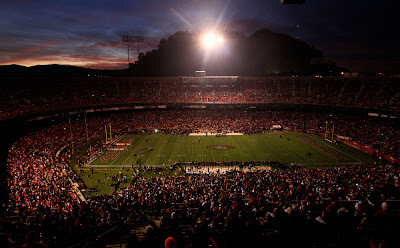 Perhaps if they could just find enough electricity at Candlestick Park for one quarter of the football game, it would miraculously last for all four quarters? While Christmas is among the top two Christian holidays in terms of importance, Hanukkah is considered a minor holiday for the Jewish people. Nevertheless, it has become one of the more widely celebrated Jewish holidays and it is certainly a favorite among children. Hanukkah commemorates the victory of the Jews over the Syrian Greeks in 164 BCE (Before Common Era) and is celebrated by lighting one additional candle in a candelabrum, called a hanukkiah (or menorah) for eight days. The holiday is also known as the Festival of Lights. Hanukkah means rededication and refers to the rededication of the Temple in Jerusalem after its defilement by the Syrian Greeks in 164 BCE (or BC). Beginning in 167 BCE, the Jews of Judea rose up in revolt against the oppression of King Antiochus IV Epiphanes of the Seleucid Empire. Judah the Maccabee was the leader of the Jewish army. Judah and his followers were able to capture the Temple in Jerusalem, which had been turned into a pagan shrine. They cleansed it and rededicated it to God. Following the rededication, they observed an eight-day celebration, which was patterned after the autumn harvest festival of Sukkot. The Jewish people were not able to properly celebrate Sukkot during the siege and thus observed it in the winter, which later became Hanukkah. A much later story written by the rabbis of the Talmudic period claims that the eight day festival of Hanukkah was to celebrate the miracle that a small amount of oil that was only enough to keep the menorah burning for one day actually lasted for a full eight days. For the most part, Hanukkah is a home-based holiday with many rituals that take place in the home rather than the synagogue. Central to the holiday is the lighting of the hanukkiah, an eight-branched candelabrum. Each night of the holiday (beginning this year on the evening of Dec. 20) an additional candle is added to the menorah. It is also customary for children to play a dreidel (spinning top) game during Hanukkah. To celebrate the legend of the miraculous cruse of oil that kept the menorah lit for eight days, it is customary to eat foods fried in oil. The most familiar Hanukkah foods are latkes (potato pancakes) and sufganiyot (jelly donuts). Small pieces of chocolate in the shape of small coins are also traditional treats during the holiday. Likely as a response to the gift-giving custom of Christmas, Hanukkah has evolved into gift-giving holiday as well. Some families exchange gifts during each night of the holiday, while other families may only give one gift over the course of Hanukkah. It is customary to send Hanukkah greetings cards to friends and family. Although the minag of giving gift on Hanukkah evolved because of the procsimity to Christmas, the minhag of Hanukkah gelt in Yiddish or Dmey Hanukkah or Maot Hanukkah in Hebrew is purely Jewish. We am children used to get it from parents and close relatives and I sent it to our 6 out of town grandchildren, However, instead of the half lira I used to get, they received a 10 dollar bill each. Still Dmey Hanukkah it is, a pure Jewish Hanukkah tradition.